I’m baaaack in the US and I could not be happier to be reunited with my kitchen. I have been cooking/baking up a storm since I arrived.. Most of my kitchen adventures have been experimental though–some of which have turned out not-so-amazing–which is why this is my first post back. Also I’ve been back for weeks and I haven’t written anything yet ooooops. It’s just so easy to put off sitting down and writing a blog post. But I’ve now made 2 amazing things that I absolutely MUST SHARE; they’re tears-in-my-eyes good (brownies now, blondies to follow). I’m nearly drooling just thinking about them. Apparently I’ve been on a cookie bar kick, which is odd since I rarely make things like brownies or blondies. These brownies were for Father’s Day (eep that was a long time ago and I’m just writing this now oooooops) which apparently I’ve accidentally made an annual tradition. These were better than last year’s though. Different, for sure, but better. These ones were also flourless (see first ever blog post for other recipe), but these were definitely a little more exciting. I took my dad’s love of the deepest darkest chocolatey thing you could imagine, combined it with his love for coconut and his request for a cheesecake for Father’s Day (after I’d already started making brownies…oopsies sorry!) 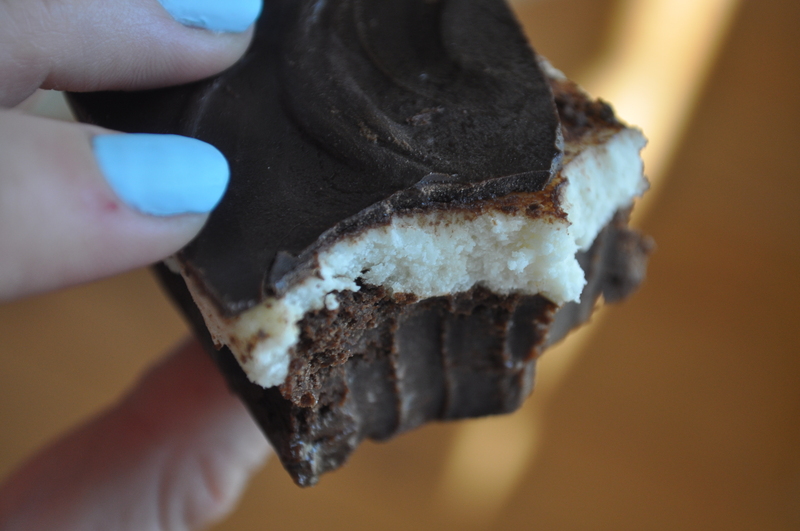 et voilà, I came up with this lovely little combination of GLUTEN FREE (if you’re into that) dark chocolate brownies with a coconut cream cheese layer and topped off with a semisweet chocolate shell. Shell? Glaze? Top layer? You get the point. There’s chocolate on top. In other words, yum. 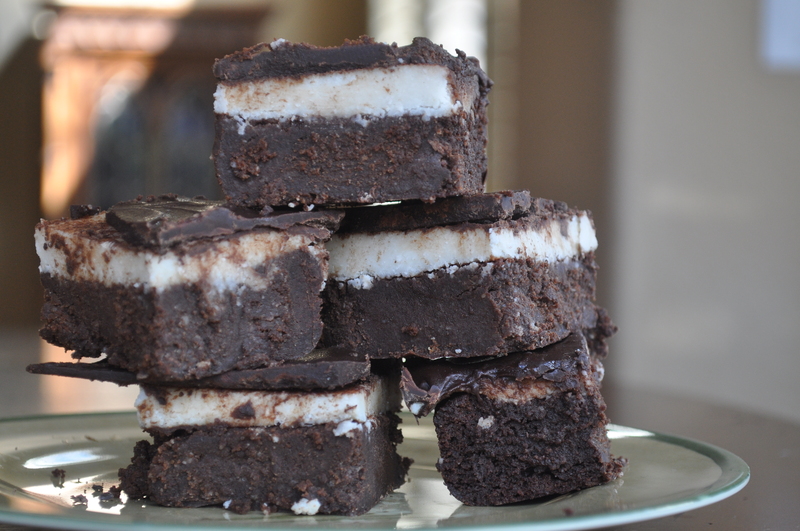 I got the idea from this recipe for buckeye brownies, but I left out the peanut buttery layer and added my own twist. These were great. Make ’em. Grease an 8×8″ pan and set aside. Preheat the oven to 350° as per usual. Combine the melted chocolate, melted coconut oil, and coconut sugar together in a bowl. Add the eggs one at a time, mixing between each egg. Add the salt and the vanilla and mix again. Sift the cocoa powder, cornstarch, and almond meal together in a small bowl and add to the wet mixture. Once combined, pour the batter into the prepared pan and bake for about 30 minutes until a toothpick comes out clean when stuck in the middle. Set on a cooling rack and step away from the brownies so you can make your next layer. Maybe even stick it in the fridge so you’re not tempted (that’s what I did). Melt the chocolate for the top layer and add the coconut oil. Pour the chocolate evenly over the top of the coconut frosting layer. Stick it in the fridge until the top layer sets, cut into them, take a bite, die of happiness. Repeat. Categories: Dessert | Tags: brownies, chocolate, coconut, cream cheese frosting, dark chocolate, dessert, flourless, gluten free | Permalink.